Sometimes it seems like I must have dreamed it; that before the year 2000, I used to lead my tour groups around Jerusalem’s Temple Mount, and into the Dome of the Rock and the Al Aqsa Mosque. Those were days when the Mount often seemed strangely tranquil, amid unrest elsewhere in the country and even in the city. This was the eye of the hurricane, I used to tell people. The Temple Mount and the Western Wall. Courtesy of the Israel Ministry of Tourism; photo: Noam Chen. But over the years, beliefs about the Temple Mount’s sanctity have been gathering into what seems like a tidal wave of fury and hatred. Now the Mount has become a flashpoint again. The recent spate of violence was sparked in mid-July by the killing by terrorists of two Israeli policemen on duty outside the Mount, followed by the killing of the terrorists on the Mount and the killing of three Israelis in their home in Samaria by a terrorist. In the wake of clashes with security forces over these past two weeks, hundreds of Palestinians were injured and at least six Palestinians have been killed in the midst of clashes, mainly in the West Bank and Gaza. What I’d like to do here is to help illuminate a little of what the Mount means to the different religions that sanctify it. There is so much to read on the subject that one lifetime isn’t enough. But at the end of this article, you’ll find a small assortment of less familiar sources, some of which I quote here and which I’ve found helpful. Flash back 2,000 years, and you’ll find ancient texts that extol the Temple, and by extension the Mount, as the embodiment of peace and unity, the very antithesis of bloodshed. Truly, it is a great idea and ideal – a uniquely perceived sacred intersection of space and time. And it has been disastrously diminished by self-serving small-mindedness, especially of late, into a wicked scrummage over a piece of real estate. The Temple was the intense focus of Israelite/Jewish practice – notwithstanding the thwarted desire for decentralized worship and the railing of the prophets against sacrifice in the midst of corruption and deceit . The Roman destruction of the Temple sparked a crisis in Jewish faith and practice that was turned into a fateful crossroads by sages like Rabbi Yohanan Ben Zakkai, who said that Temple sacrifice and worship could be represented by “deeds of love, as it is said [Hosea 6:6] for I desire loving-kindness, and not sacrifice” (Avot de Rabbi Natan 4). And yet, the rebuilding of the Temple continued to flicker in various sources over the centuries. 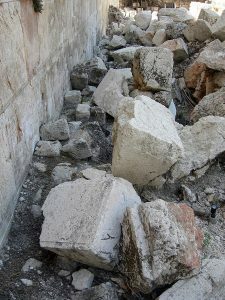 Stones that fell from the Western Wall at the moment of its destruction by the Romans. Photo: Wikimedia Commons. Fast forward to the modern era, and the secular Zionist movement, which espoused an essentially practical project – the return of the Jewish people to their ancestral land. Even so, it couched its philosophy in messianic terms of redemption. According to comparative-religion expert Dr. Tomer Persico, Israel’s visionary first prime minister, David Ben-Gurion, believed that Jewish sovereignty over the Temple Mount would preclude “the fulfillment of Zionism’s progressive worldview.” Persico, among others, has noted that Zionism sought to make use of the idea of a rebuilt Temple, but to clothe it in secularity – national home, yes; Temple, no. The relatively recent movement by nationalist Orthodox people to ascend to the Temple Mount, and the outcry in those selfsame circles about the method of the government’s resolution of the current crisis, are a sign – which can be either worrisome or joyful depending on who you ask – that this dichotomy may be failing. As for Christianity and the Temple Mount, Jesus’ relationship with the Temple spanned literally his entire life according to the New Testament. As the first-born son he was presented in the Temple; at age 12 he accompanied his parents there on the Passover pilgrimage; the devil dared Jesus to jump from the Temple’s “pinnacle”; on Hanukkah he taught in the temple courts; he prophesied the Temple’s destruction and perhaps most famously of all, he overturned the tables of the moneychangers in the Temple courts. Christian texts, John 4:21 for example, seem to regard the sacrifice of Jesus on the cross as replacing sacrifice in the Temple and the Temple itself. Yet over time, many Christians have come to look forward to the rebuilding of the temple as an essential harbinger of Jesus’ return; some see political unrest as part of that process. This is but one example of the complexities of Christian views on the Temple, surveyed in an article by Oded Irshay that you’ll find in the reading list below. According to legend, when Christians first ruled Jerusalem they maintained the Temple Mount as a heap of garbage and rubble. But as time went on, Jerusalem was seen as key to the End of Days, and the rebuilt Temple actually became essential to that vision. Over the past two decades or so, this has led to a confluence of interests that brings thousands of Christians annually to the Temple Institute in Jerusalem, which teaches about the laws regarding the rebuilding of the Temple and hints broadly of its desire to bring that about. Ironically, the Temple Institute might be one of the few places anywhere where a devout Christian and an Orthodox Jew might meet, both geographically and ideologically. And what about Islam’s views of the Temple Mount? The rock where Abraham offered his son, and from which in Islamic tradition Mohammed ascended to heaven, now crowned with the Dome of the Rock, is their third holiest site after Mecca and Medina. One of their many names for the esplanade is Al Aqsa, after the eponymous mosque on the Mount. The devotion of Islam to Jerusalem and the Temple Mount has been in evidence for centuries. Islamic tradition has a specific genre of praise literature going back to the seventh and eight centuries called Fada’il Bayt al-Maqdis (“Praises of Jerusalem”). Jerusalem is not mentioned specifically by that name in the Koran, yet in this genre and in other literature it holds an essential place in the Islamic view of final judgement, redemption, resurrection, heaven and hell. And speaking of names, one of Islam’s names for Jerusalem is Bayt al-Maqdes, from the Hebrew Beit Hamikdash, which means Temple. One such tradition, cited by the 11th-century Ibn al-Muragga, and quoted by Ofer Livne-Kafri (another source in the list below), clearly links up to Christian beliefs. It expresses the idea that the hour of resurrection “will not come until seven walls of precious stones, gold, silver, clouds, and light are set around Jerusalem.” In another place, Ibn al-Muragga writes that God will send winds that will “uncover every stone and building and they will purify them from all the damages of men. Then he will build around it seven walls: a wall of light, upon which are the angels of holiness, and a wall of clouds and a wall of topaz and a wall of sapphire and a wall of pearls and a wall of silver and a wall of gold,” going on to mention that at that time Jesus will appear in Jerusalem. Chen, S. “Visiting the Temple Mount: Taboo or Mitzvah” Modern Judaism 34, 1. February 2014, pp. 27–41. Feinberg Vamosh, M. 2010. 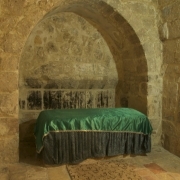 “Meaning of the Mount.” http://www.haaretz.com/jewish/books/meaning-of-the-mount-1.260723. Grabar, O. and Kedar, B.Z. 2009. Where Heaven and Earth Meet: Jerusalem’s Sacred Esplanade. Jerusalem. Irshay. O. 1996. “The New Testament Temple.” Eretz. May–June 1996, pp. 30–35. Arabica, T. 53, Fasc. 3 (Jul., 2006), pp. 382-403. http://holyland.oucreate.com/wp-content/uploads/2016/01/livne-kafri-jerusalem-in-early-islam-eschatological.pdf. Marx, D. “The Missing Temple: The Status of the Temple in Jerusalem in Jewish Culture following Its Destruction. European Judaism 46, 2: 2013: 61–78. “Tunnel Visions.” 1996. An interview with Prof. Dan Bahat. Eretz, May–June 1996, pp. 7–8.